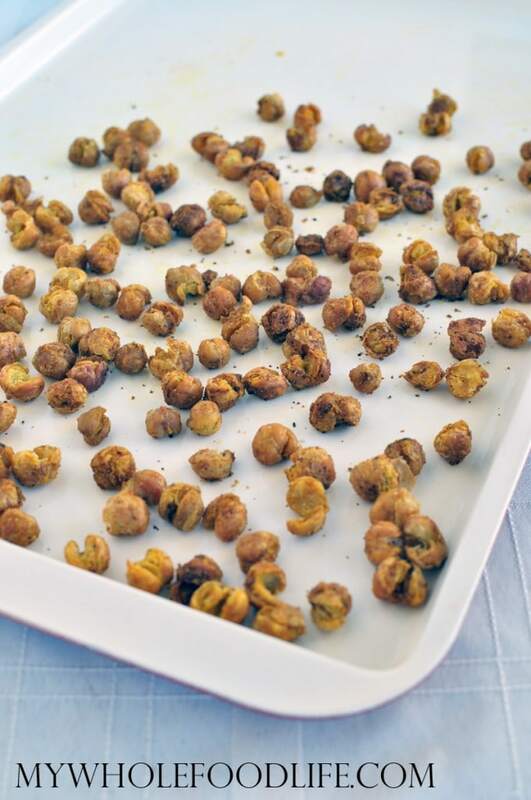 Have you tried roasted chickpeas? They make such a delicious snack. You can make them sweet or savory. Today I opted for savory to make these Curry Roasted Chickpeas. These were so good. I had to hide them from my husband, because he kept trying to eat them before I could shoot the photo! My 6 year old liked them too. They make the perfect healthy snack. These roasted chickpeas are perfect for those with allergies since they are nut free, vegan and gluten free. Safe for school lunch boxes too. If you wanted more of a sweet curry flavor, you can add a little maple syrup. A healthy snack option perfect for schools. In a large bowl , mix all the ingredients together. Spread chickpeas onto a lined baking sheet . Bake for 45 minutes, stopping every 15 minutes to shake them around. If the chickpeas are not crispy after 45 minutes, you can cook them a little longer. Keep these stored in an airtight container with some rice scattered on the bottom. The rice will help absorb the moisture and keep the chickpeas crunchy. Enjoy! I just made my first batch of roasted garbanzos. I'm working on the post right now. I've been wanting to make these in forever. I love your version. I know what you mean...they go fast. I'll be making a double batch next time. :) Pinned for later. Did you use foil of parchment to line the baking sheet? I use a silpat, but parchment works too. This looks like the perfect savory snack! I love how simple the recipe is too! Just made a tuna salad and topped it with these curry chickpeas! My daughter likes these over the smokey ones. I like them both! I need to try a sweet version soon. These guys are perfect for snacking! Love the curry spices! Oooh yum!! I'm always looked for more protein-packed vegan snacks and these are perfect! These are delicious! I soaked the uncooked beans first for 24 hours, then sprouted them in an upside down mason jar, then boiled them for about an hour and a half and continued with your recipe. They were gone in less than a day so I made a double batch the next day with the remaining sprouted beans. A perfect snack! Can't wait to share these with friends. I LOVE roasted chickpeas (and your recipes are always the best). How long will these last?